TEAC iPod dock aims for budget appeal | What Hi-Fi? 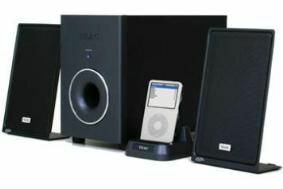 The stylish look is maintained by the use of a hideaway subwoofer, and the dock itself will accommodate almost all iPods apart from very early models and the Shuffles, but even these can be connected using the system's auxiliary inputs. The dock also has composite and S-video outputs, with suitable cables provided, and both 3.5mm and RCA phono inputs. It'll charge iPods while they're in place, and comes complete with a remote control handset. The speaker system uses 25mm NXT exciters driving aluminium honeycomb main speakers, and a conventional 10cm driver in the subwoofer. The power output is 5W per channel, with 15W for the subwoofer, and the main left/right speakers can be wall-mounted.